Project: Interior Design in a tiny existing single story Art Deco brick veneer house in Pascoe Vale, originally built for a WWII war veteran, which is currently undergoing extensive structural renovations to suit a young family. 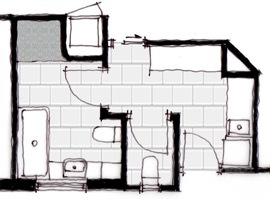 The design brief is to design a light, bright family bathroom & laundry, and to provide colour & finishes advise for a new kitchen, for a renovation that was already in construction. Now we’ve locked in a final bathroom layout, and commenced concept design stage on this project; it’s exciting to see the design evolving. We’ve addressed the practical aspects, such as squeezing as much storage space in as possible (whilst ensuring the storage does not engulf the room), massaging & find-tuning the layout, selecting the main fixtures such as bath & basin. My client has always had in mind that they wanted a walk-in shower with frameless glass screen, one of those small details which has a big impact visually maintaining that un-cluttered look so important in successfully designing a small room. Alongside this we’ve been exploring colour, finish and texture; key elements of the initial brief were to bring colour and a hand-made quality into the bathroom. My client also has a large circular Art Deco mirror (a family treasure) that by chance in our initial meeting was brought into the conversation as a possible feature to use in the bathroom that my client had not considered. 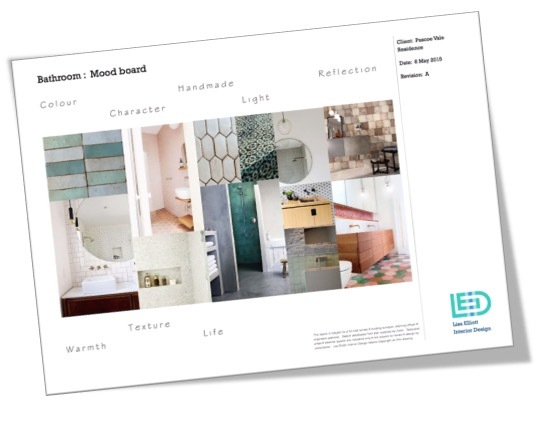 This is where mood boards come into their own – snippets of designs from magazines, feature finishes, textures – anything that communicates the right message. It is an initial process of to-and-fro between designer and client to get the look and feel right from the start. I’m constantly keeping an eye out for interesting designs & ideas of all sorts (from office design, to restaurants and residential design I never know what I might need next), and Pinterest (which is where you’ll find the images in the mood board below) & Houzz are the perfect medium for filing ideas. My clients often already have a page of ideas they have saved that they share as part of the brief. The next step was to transform the mood board into reality. 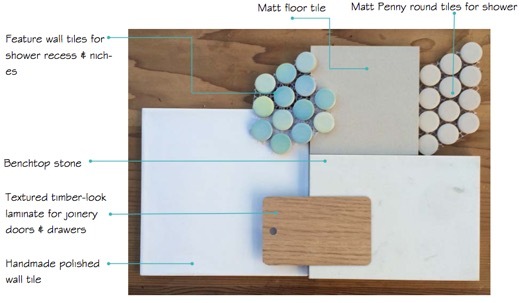 My client has a creative background as a costume designer, and the opportunity to play a key role in selecting finishes such as tiles for the wall and stone bench top from local suppliers were and important part of the overall project for her as a home-owner.